There is a lot of information available about AME Info on the web and as I have not been involved with the company since 2008 I am not going to comment on what or how the company is doing today. If you are interested in the beginning however, you can read a bit about how AME Info started. Instead I thought it might be interesting for some of you to look at the television marketing activities AME Info was involved in under my shift. 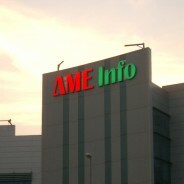 In May 2002 AME Info entered into a significant marketing tie-up with CNN International. Under the agreement the two organizations would respectively promote each others’ services online and on air. The theme used for the television commercials produced in 2004 and 2005 was to feature our advertisers, sponsors and partners alike by simply asking them how they used AME Info in their business. As timelines are becoming increasingly popular in 2012, below is a collection of all the TV commercials AME Info released in the period 2002-2006 as a tribute and a warm thank you to everyone on screen as well as Lisa Creffield for filming and production support and Steve Marney who is the man behind the voice delivering the signature closing message: “AME Info dot com – the ultimate Middle East business resource”. Apologies, HD was not really a very popular option “back then” in mid-2000 – hope you will enjoy watching them anyway. © 2002-2006 AME Info FZ LLC. All rights reserved.